Unorthodox Swedish Blackened Death Metallers Godhead Machinery have returned for their sophomore album “Aligned To The Grid” andand sign to Finnish label Inverse Records. The follow up to 2017’s “Ouroboros” sees vocalist Niklas Ekwall joined by Guitarists Robert Kail Karlsson (who also did the impressive cover art) and Tommy Ericson with a rhythm section of bassist Daniel Forsberg and drummer Marcus Somliga Andersson. Released a month before the album saw the cold light of day “Tithe II” brings a haunting melodic intro and film sample speech about greed before it sweeps into a flourish of frenetic blast beats and classic Black Metal riffage. Ekwall’s vocals sit as a growling unclean constant in the bands whirlwind of instrumentation. Second pre-release single “Alpha” continues that controlled chaos with Andersson’s at times break neck speed kit work giving him a serious work out. It builds on traditional structures and there is a hint of a Progressive Black Metal sound underlying as the guitars build through the track to create an epic ebb and flow. The dark classical piano and guitar introduction to “The Existential Strive” acts as a cloak for the coming verse with Ekwall’s vocals reaching some hither to unheard of lows with a more drawn out style. Imagine Max Cavalera in his Sepultura days on quarter speed, dragging the waters of a lake for corpses and you get the idea. The decision to continue the conversation of political and religious greed with very similar lyrical themes to the bands debut album on this sophomore effort perhaps tells us that the state of the World has not changed in that time. Bringing back the speech samples “Call of the Banner” doesn’t use some old speeches from black and white movies but instead Godhead Machinery opt for something of a news piece. It explores the phycological state of mind in the absence of vocals while the band demonstrate how to create an atmosphere in fine style. Bringing a menacing overtone of off kilter riffs and thunderous bass from Forsberg “Defiant Silence” attacks in waves and managing to sound like it’s been done in a single take. The obvious anti religious song title in “Hymns of the Wicked” has a weight of expectation to it and the 61 second choral piece is quickly savaged by the opening riffs of “Above a Legion of Equals”. Those Choral elements continue into the later track as the demonic vocals cut through the guitar work. Does it need to have a separate introduction track? Probably not, the two could be intertwined happily. Does it work? Hell yes! They are an epic pair that make the mid section of the album shine in black light! Throughout the album there is a clear intension to add a greater depth and bigger dynamic than the bands debut “Ouroboros” perhaps showed and if evidence was needed, this pair together are the perfect example of that. 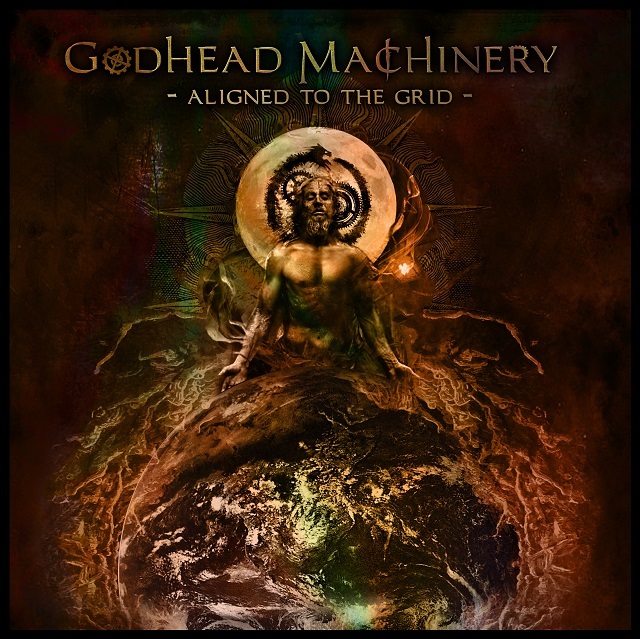 “Aligned to the Grid” by Godhead Machinery is out now via Inverse Records!